Mangoes come after a spell of sweltering heat. The more cruel the summer gets the more juicy the mangoes become. Nature compensates somehow and also ensures there is something that thrives in every season, something that people find comforting in every season. How I thank for all the watery cucurbits (gourds) in the summer for quick cooling meals and the melons and stone fruits for the juicy flavorsome nourishment they bring in summers and the abundance of crucifers (mustard family vegetables) and the innumerable berries, citrus fruits, guavas. pears, apples and zizyphus in the winters. To some people, summer's best gift is a ripe juicy mango. 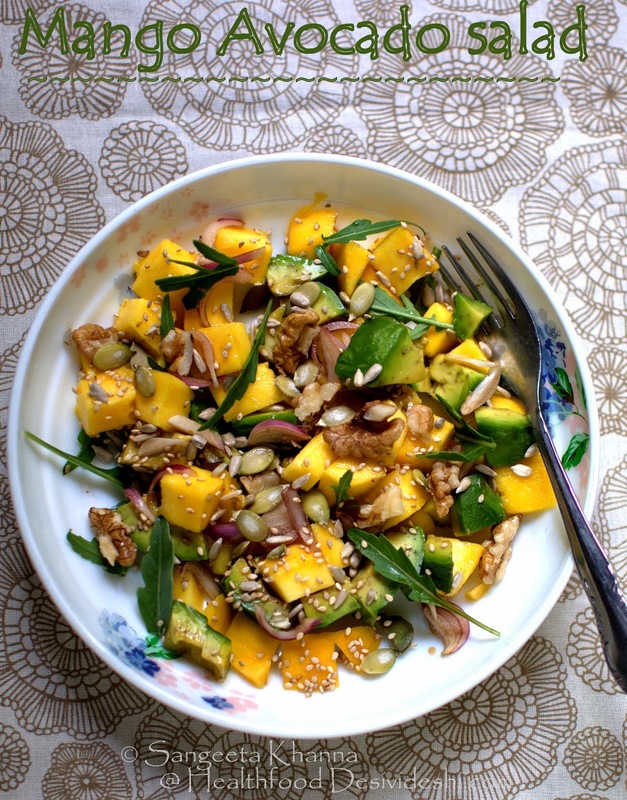 Full of antioxidants (polyphenolic anti oxidants and flavonoids), vitamins (B6, C, E and traces of Vit K) and minerals (moderate amount of copper), mangoes are considered alkalising food and great detox food too. Some people consider it as a fruit responsible for weight gain and some think it brings too much heat into the body and causes boils on face. Well, there are misconceptions about mangoes being fattening in the modern world and there is some traditional wisdom that explains everything. Mangoes do not heat up the system but can cause boils on the face if the fruit is not consumed properly. There are a few precautions one needs to take care of before consuming mangoes. 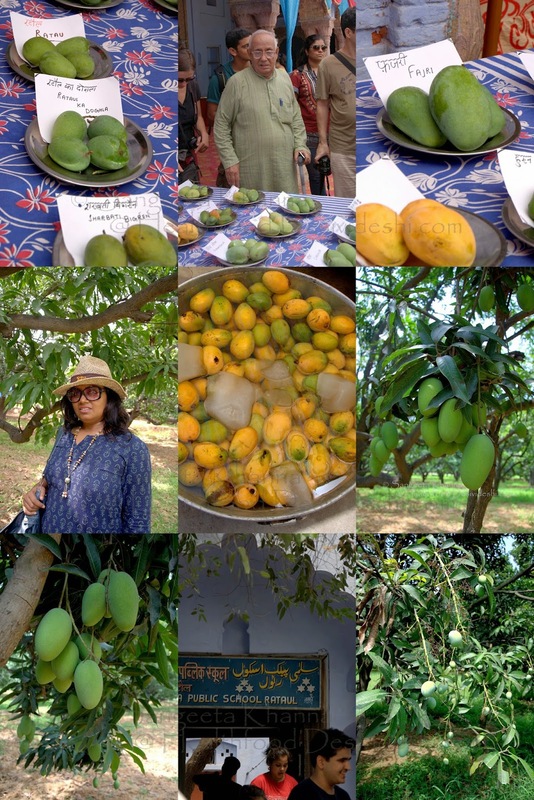 I will list them all but let me tell you that we had a day trip to a place called Rataul which is about 50 kms from Delhi, known for growing several varieties of mango and is one of the several places proud for it's mangoes. A mango variety that was developed in this place and named Rataul is considered the onset of mango breeding and grafting in this small village on the border of Uttar Pradesh. The grandparent of the Rataul mango still stands tall on the border of a field. 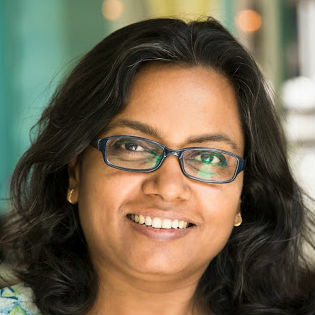 This article talks about how someone started working on breeding mangoes in Rataul and how it was named. We had joined Mr Sohail Hashmi who makes an effort to take a few mango enthusiasts from the city to Rataul where Mr. Zahoor Siddiqe welcomes us all in his ancestral home and treats us with huge cauldrons of mangoes. Mr. Zahoor Siddiqe is a retired professor from DU and runs a school for underprivileged girls in the village, entire savings from the day trip were donated to this school. A great way to celebrate heirloom mangoes, to visit real mango orchards, to know about the picking practices and how the real tree ripened mangoes are transported to the nearby cities. I actually talked to the people who stay in the mango orchards and guard them and got to know that they collect only the mangoes that fall from the trees when they are ripe. Fully ripe unblemished mangoes are collected, arranged in baskets and sent to nearby mandis. I am impressed. More reasons to eat local I say. If the mangoes or any fruit are coming to your city from a 100 km periphery, they are ripened on the tree, else they are plucked too early from the trees and are ripened using chemicals, that kind of fruit lacks the real taste and we blame it on how the real mangoes have disappeared. We get to eat real mangoes only if we choose to buy local produce, the ones that travel thousands of miles are chemically ripened. How to recognize tree ripened mangoes.. Recently someone asked me how to get tree ripened mangoes and I had no definite answer because I don't find vendors who stock only tree ripened local mangoes. The only way I find them by keep looking for such mangoes and buy them whenever I spot them. I shared about how to recognise tree ripened mangoes on my fb page and got many messages in my inbox asking if mangoes are healthy. Hence bringing all the answers here at once. 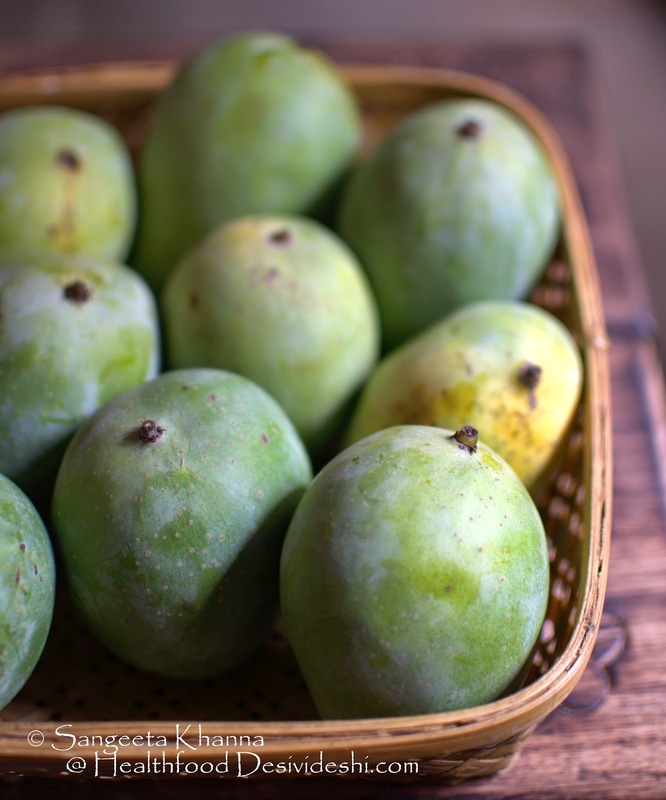 So the best way to recognize tree ripened mangoes is, to look for a freshly plucked sign. And that is the small part of the stalk attached to the mango, still green, may be a bit shriveled or even absent, but the area around the stalk should look fresh and plump, not sunken. Ready to pluck mangoes may ripen in a week's time, enough to be transported and sold to nearby cities. Fully ripe mangoes fall from the trees by themselves and are the best. 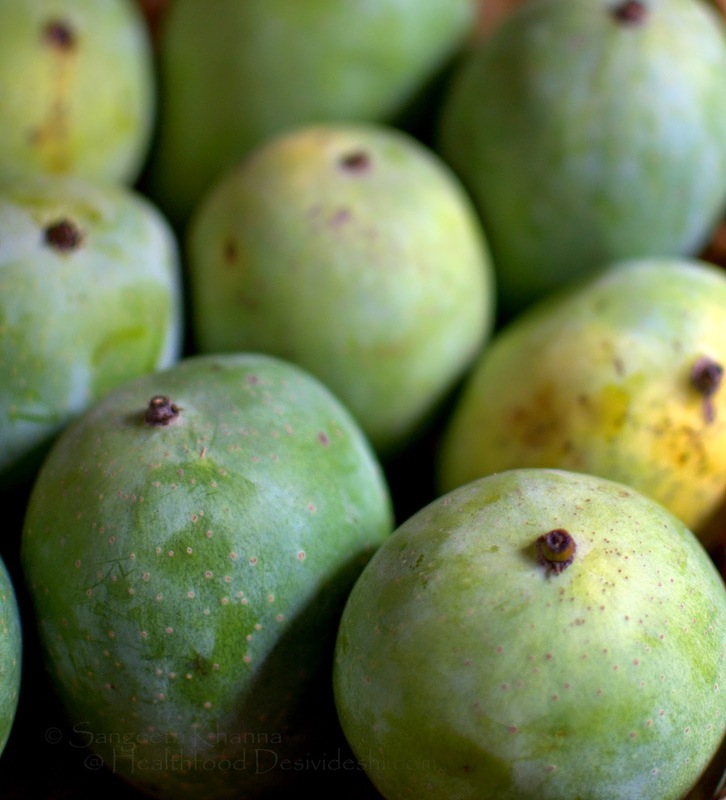 You would start recognizing them once you get the taste of the real ripe mangoes. Taste is the best test. 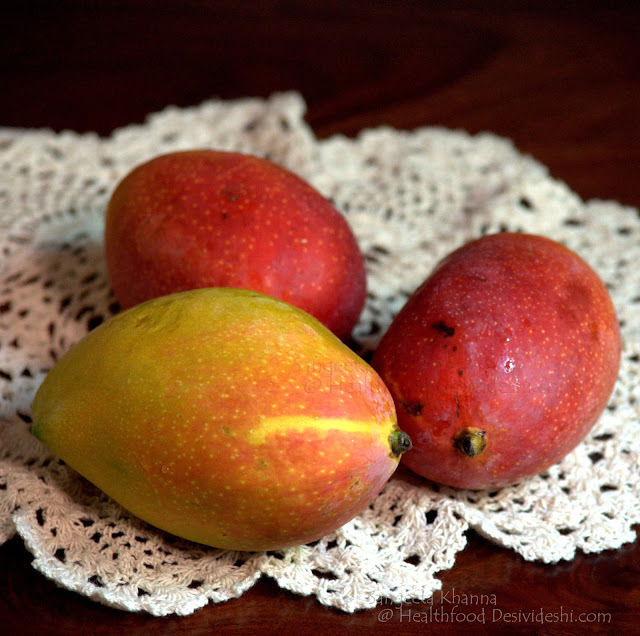 Are mangoes fattening? Are they responsible for boils? We have grown up eating mangoes by the dozen, sitting besides a large bucket of mangoes and sucking the juicy flesh out of them till we were soaked in mangoes, inside out. Literally. No one gets fat eating mangoes this way. But if the mangoes are used as a topping on the ice cream, icing on the cake or filling in a pastry, BEWARE. And please know that it is not the mango to be blamed for. Also, if a couple of mangoes are had after a heavy filling meal, they would definitely add up to the total calories and will cause weight gain. Have only mangoes for 2 days and see what happens. One, you wont be able to eat too many calories, secondly you will purge the calories as easily as you ate them. Mangoes are good cleansers of system. Yoga guru Bharat Thakur says eating mangoes with yogurt for 3-4 weeks results in great weight loss But then it is just the mangoes and yogurt for weeks :-) And I have never tested this theory so cannot say anything. To avoid boils after eating mangoes, one must soak them in a bucket of water for at least 4 hours and then consume it. The acrid gummy resin that accumulates just below the stalk, is responsible to cause burn when exposed to skin (especially the corners of lips) and consumption (ingestion) leads to boils. Once the mangoes are soaked, the resinous exudation is washed off as it is water soluble. Removing a part of the mango adjacent to the stalk is a good way to avoid burns and squeezing off the liquid before sucking into a whole mango if you like it that way, is a better way to avoid burns and boils. Make a meal of mangoes and see how sated your system feels. Do not worry of weight gain but limit the serving size if you are working for weight loss as mangoes can be addictive and you might end up eating loads of it, may be along with more calorie dense foods during the day. Choose the best ripe juicy mangoes and cube them. Take a ripe avocado, cut in half and cube the flesh of one half. The ratio of mangoes and avocado can be as per choice. Mix a cup of cubed mangoes and cubed avocados and spread on a platter. Balsamic soaked shallot slices and sprinkled as desired. This can be avoided if you don't like it. Mix with a few rucola leaves and serve immediately. You can always use coriander greens or mint leaves. Or avoid it altogether. This salad has a riot of flavours and textures complementing each other. You might end up stirring this salad almost everyday once you are hooked. For us it is not that frequent as getting nicely ripened avocados is not so easy in Delhi. But whenever we get them, we make something yum. Mango poha in coconut milk with a hint of red chilly flakes..
Rinse and drain 1/2 cup pf poha (flattened rice flakes) and mix with 100 ml of coconut milk. Add 2 pinches of salt and mix well. You don;t want the salt to overpower the sweetness of mangoes and coconut milk. So just a hint of salt will be added. 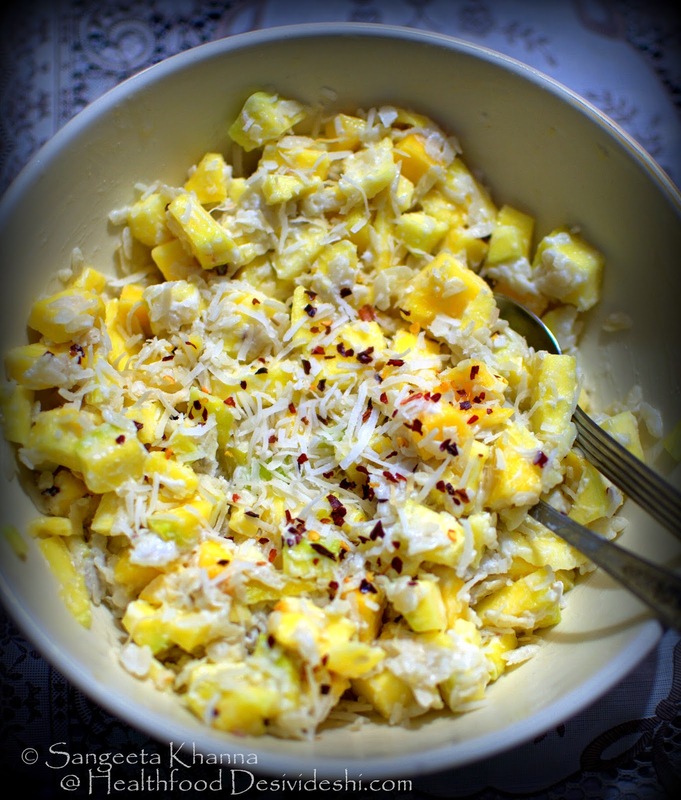 Cube 2 ripe mangoes and mix with the poha and coconut milk mix. Sprinkle with 2 tbsp grated fresh coconut or dehydrated coconut flakes. Sprinkle with roasted red chilly flakes and serve immediately. This is one filling meal on a summer day. We often eat raw meals during summer as it is good for the system as well and doesn't demand time spent in the kitchen slaving the stove. 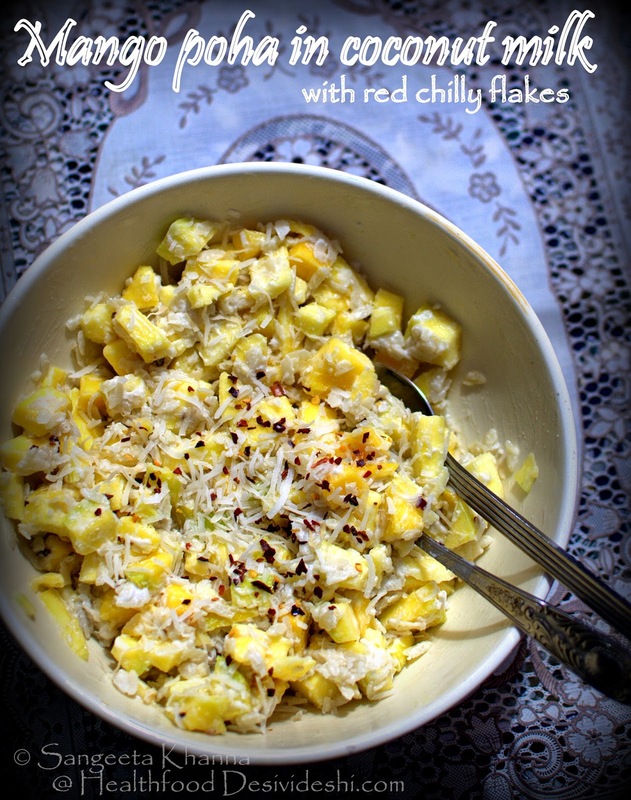 One more mango poha recipe is our favourite and quite frequent during mango season. Flavors of this mango coconut poha is just out of the world. We have it for dinner many a times and we both eat from the same mixing bowl. Such foods induce a feeling of togetherness I say. Calcium carbide (CaC2) is used to ripen many fruits including mangoes and banana and is called as 'masala' in Indian mandis. While this chemical is banned in many countries, some farmers and mandis (fruit markets) India Pakistan and Bangladesh etc are still using it for ripening the fruit. CaC2 contains traces of Arsenic and Phosphorous hydride and cause several chronic and acute health hazards in Humans. The symptoms can range from vomiting, Diarrhoea, skin burning to disturbance in neurological system by inducing prolonged hypoxia that causes headaches, confusion, dizziness, memory loss etc. See this article and this article to read more about the harmful effects of CaC2 and artificial ripening of fruits. Now you know why choosing naturally ripened fruit is always safe. And brings good taste too.